Ahead of the start of the Premier League season this weekend, stars of the Wales football squad are encouraging fans to go online and find out their risk of Type 2 diabetes. 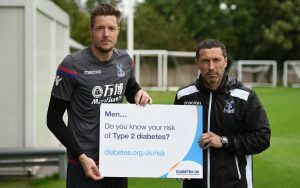 Wayne Hennessy, goalkeeper for Wales and for Crystal Palace FC, and Dr Ryland Morgans, Head of Performance for the Wales national squad and Crystal Palace FC are supporting Diabetes UK’s Know Your Risk initiative. Research has shown that 38 per cent more women than men use the free tool, despite the fact that men are more likely to develop Type 2 diabetes. Diabetes is a condition where there is too much glucose in the blood because the body cannot use it properly. If left untreated or poorly managed, it can lead to devastating complications such as amputation, blindness, heart attack and stroke. Unlike Type 1 diabetes, Type 2 diabetes can often be prevented through eating well, staying active and maintaining a healthy weight. The Know Your Risk tool is a simple-to-use online questionnaire developed by Diabetes UK, the University of Leicester and the University Hospital of Leicester NHS Trust. Based on the key risk factors for Type 2 diabetes such as age, gender, weight, waist measurement and ethnicity, it gives a calculated analysis of an individual’s risk of having or developing this serious health condition in the future. Wayne Hennessey and Dr. Morgans took part in a photoshoot to encourage fans to know their own risk ahead of the start of the season. Dr. Morgans has worked with some of the world’s top players, including Gareth Bale, Aaron Ramsey, Luis Suarez and Philippe Coutinho and was part of the coaching team which helped Wales reach the semi-finals of UEFA Euro 2016. The cause is particularly personal for Dr. Morgans, who has Type 1 diabetes. Dr. Morgans said: “Wales has the highest prevalence of diabetes in the UK as 7.1 per cent of people aged 17 and over are living with the condition. Diabetes UK estimates that a further 57,000 people in Wales live with Type 2 diabetes but have not yet been diagnosed. Diabetes UK Cymru’s National Director Dai Williams said: “Diabetes is the most devastating and fastest-growing health crisis of our time, with Wales having the highest prevalence of the condition in the whole of the UK. While there is nothing we can do to prevent Type 1 diabetes, around three in five cases of Type 2 diabetes can be prevented or delayed by maintaining a healthy weight, eating well and being active. Find out your risk of developing Type 2 diabetes by visiting using the Know Your Risk tool at www.diabetes.org.uk/risk.